Nowadays it is common to come around phrases like Data Warehouse, Data Lake. Data warehouses is four decade old established concept. 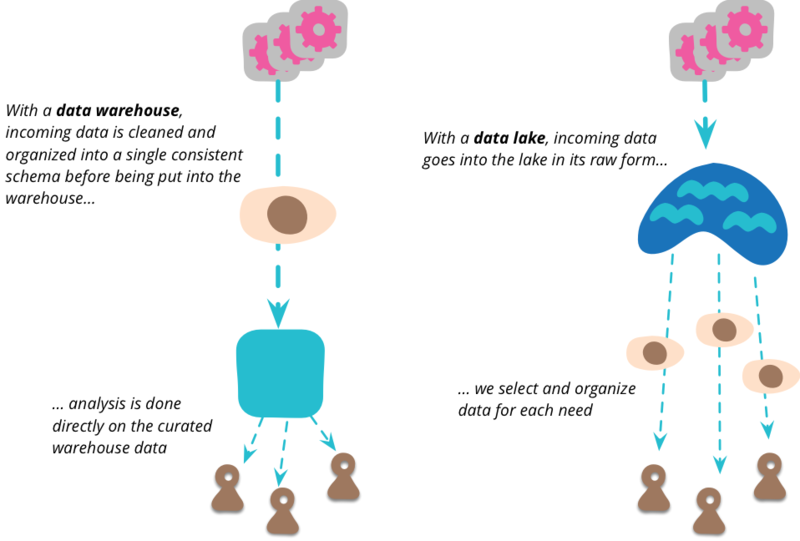 Data lake is a new idea. What is the difference between Data Warehouse and Data Lake? We talked about the concept about Data lake in a previous article. Explanation of Data Warehouse is needed. Database is the most common way of data storage for the digital data. Most commonly relational database like SQL is used, whose commonly known implementation is MySQL. A Data Warehouse is a database of some or all of a company’s business data. It is part of business intelligence. Its purpose is to provide a single reference dataset used for decision making in the enterprise through statistics and reporting through reporting tools. From a technical point of view, it is mainly used to relieve operational databases of queries that may impair their performance. The archiving of a data warehouse based on the principle of data retention or non-volatile data. In order to preserve the traceability of the information and the decisions taken, the data once entered in the Warehouse are stable, read-only, and can not be modified by the users. A same query launched several times at different times must thus restore the same results. As soon as data is qualified to be entered in the Data Warehouse, it can no longer be altered, modified or deleted (up to a certain time to purge). The principle of non-volatility contrasts with the logic of production systems, which often update the data with cancel and replace with each new transaction. Each data collected is assigned a date or a version number to avoid overlapping information already present in the database and to allow its evolution to be monitored over time. Therefore, in a data warehouse, a single time repository is required. There are many superfluous, confusing differences written all over the web. But commonly agreed differences are few in number and has logical basis. Data Warehouse deals with structured, processed data. Whereas Data Lake deals with structured, semi-structured, unstructured, raw data. Data Warehouse’s way of processing is schema-on-write whereas Data Lake’s way of processing is schema-on-read. Data Warehouse is expensive for large data volumes whereas Data Lake is designed for low-cost storage. Data Warehouse is less agile, has fixed configuration whereas Data Lake is highly agile, designed to configure as required. Data Warehouse is mature whereas is newer. Data Warehouse is designed for the business professionals whereas Data Lake is for the data scientists. This Article Has Been Shared 3487 Times! Conda is a Binary Package Manager Used By Anaconda And Other Systems of Python And R. Here is How To Install Anaconda on Ubuntu 16.04. Cite this article as: Abhishek Ghosh, "Difference Between Data Warehouse And Data Lake," in The Customize Windows, June 15, 2017, April 21, 2019, https://thecustomizewindows.com/2017/06/difference-data-warehouse-data-lake/.